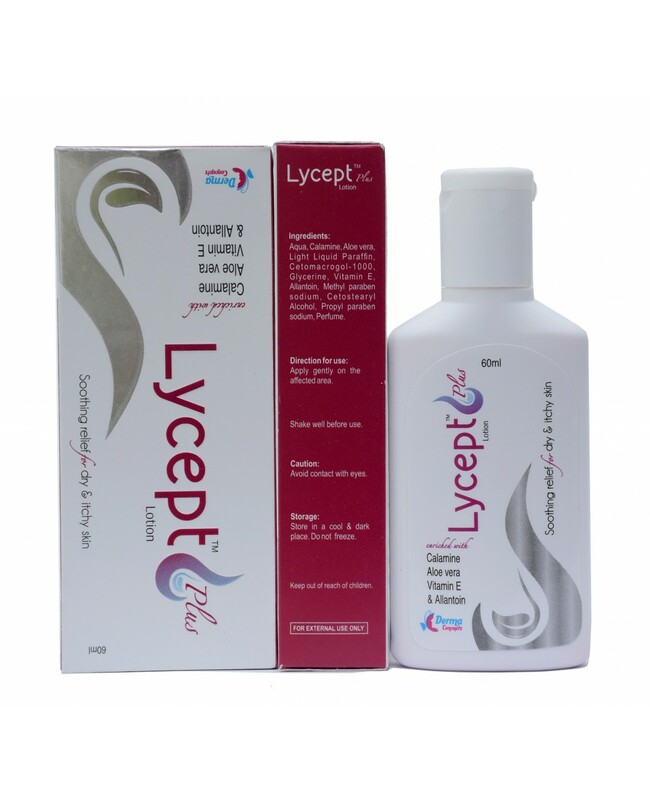 LYCEPT PLUS LOTION is used for the treatment of Skin Problems, Sunburn, Contact Dermatitis, Urticaria, Insect Bite, Hyperlipidemia and other conditions. Calamine, also known as calamine lotion, is a medication used to treat mild itchiness. Calamine lotion is a skin protectant which includes protection from sunburn, insect bite, or other mild skin conditions. It may also help dry out skin irritation. Calamine is a complete skin treatment which provides deep nourishment, removes dead skin and blemishes, treats acne and breakouts, and improves the overall quality of the skin. It moisturizes skin layers and keeps the skin hydrated. Calamine improves skin appearance as it helps in exfoliation and rejuvenation process. Calamine helps in restoring the natural moisture level in the skin and prevents the skin from fine lines caused due to lack of moisture. The Aloe Vera plant has been known and used for centuries for its health, beauty, medicinal and skin care properties. It is often known as the 'miracle plant' or the 'natural healer'. Aloe Vera contains two hormones: Auxin and Gibberellins. These two hormones provide wound healing and anti-inflammatory properties that reduce skin inflammation. The regular use of Aloe Vera brings glow to the skin, makes it soft, moisturizes it, nourishes the skin and removes scars. This medication is used as a moisturizer to treat or prevent dry, rough, scaly, itchy skin and minor skin irritations (e.g., diaper rash, skin burns from radiation therapy). Allantoin helps to soften and protect while actively soothing skin. It also stimulates cell regeneration promoting healthy skin. It Increases the water content of skin. It is well known for its ability to stimulate cell proliferation, encouraging new tissue growth. It is known to be extremely wound healing; research as it clears away necrotic tissue, making way for a healthy new tissue. An active skin protector it naturally encourages the skins healing process, making it a suitable ingredient for treating minor wounds and irritations. It promotes cellular regeneration, counteracting dryness and repairing an impaired barrier, allantoin encourages sensitive skin to become more resilient. This is one ingredient that really does soften the skin, it also protects chapped, sun damaged skin, it protects against UV induced cell damage.